Meliá Hotels International has opened its first state-of-the-art, sustainability-focused hotel in the Serengeti National Park, the oldest National Park in Tanzania. Meliá Serengeti Lodge is positioned on the natural terraces of the southern slopes of Nyamuma, offering spectacular views of the Mbalageti River valley. The hotel has been designed with the protection and preservation of the surrounding environment in mind. Approximately 45 per cent of the energy to power the lodge is generated by solar panels, and the hotel has taken further steps to cut energy usage on the property through its expert design, which allows the easterly bush breeze to flow through the rooms, cooling them naturally and removing the need for air conditioning units. The kitchen facilities include an on-site incineration plant which derives compost from organic waste for distribution to local farmers. The laundry service is on-site to minimise traffic to and from the lodge, whilst a plastic crusher has been installed to decrease the volume of waste transported from the property. The lodge aims to reduce plastic usage via a bottling plant located at the property’s waterhole; the plant can produce both still and sparkling water in the hotel’s grounds, allowing the reuse of glass bottles and further reducing the amount of product to be imported from outside the park. The amount of paper used at the hotel has been also significantly reduced through reliance on digital services. The food and beverage service has been designed to support local communities and farms, as well as reducing the carbon footprint of the property. Produce is sourced from the nearby Arusha and Manyara regions, supplemented by stock from the rest of Tanzania. 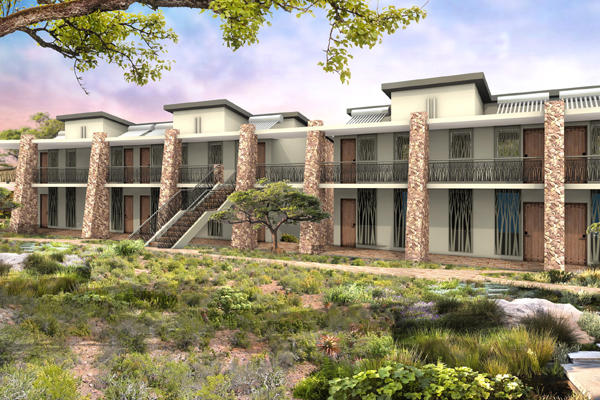 The property also provides workshops on local cuisines and beverages, educating guests in the products of Tanzania. The bathroom amenities are sourced from the South African brand Healing Earth, which specialises in high-quality products made from African resources in refillable containers, intended to further reduce the quantities of plastic packaging used at the hotel. Meliá Serengeti Lodge also stocks products from the Dada Project, Zanzibar, an organization that trains local women in cosmetic manufacture and food processing, affording them with a regular income. The Maasai tribe, who have lived in the Serengeti for generations, have also been deeply involved in the opening of Meliá Serengeti Lodge. Members of the Maasai tribe work at the lodge, making up the majority of the security team as well as several other in-hotel positions, providing the property with invaluable operational advice based on their unique understanding of the Serengeti. The hotel’s shop also helps to support the wider Maasai tribe through the sale of handcrafted bracelets and necklaces, most of them sourced directly from the Masaai Market of Arusha.